Woah it’s been crazy busy around here. There are some days where I’m struggling to find inspiration for lunch. Something different to the norm. Today I made smoked mackerel toast with a slight twist. We officially launched the Balbriggan Community Allotments on Saturday. What a day! At about 11am I got a phone call to tell me that a news crew from RTÉ would be there to cover the story. At that point I was elbow deep in cake mixture as I’d decided to make some fairy cakes for the refreshments. I made an executive decision to half the amount I would make from 100 to just 50, much to the annoyance of my biggest fans! You can see how the interview went by clicking here. RTÉ weren’t the only press who were there for the launch and you can spot my cakes at the bottom along with lots of smiley faces by checking out one of our local news websites, Balbriggan.info. The cheeky messers have coined the name “One Direction” for our free range herd of Tamworths. I on the other hand have no names for them (I get asked this a lot), as they are being reared for the table. Yesterday an interview that I had pre-recorded with Brenda Donohue of the Mooney Show on RTÉ Radio 1 was aired. That was the day I fed the children chocolate to bribe them to stay quiet. To be honest it felt a bit surreal to be speaking to Brenda in person as I normally listen to the show every afternoon while I’m making the dinner. It certainly made a change to be chatting rather than getting the family meal together. Anyway you can listen in to me on air by clicking this link for an MP3 recording if you’re interested. I’m finding the walk up and down to the playschool a bit of a chore lately. There are days that I wish I had more hours and I could certainly find plenty to do in the 2 hours it takes me to do the schoolrun. I would be up and back in maximum 30 minutes if I had a car. This means that the 4 year old has picked up on my frustrations and I’m having to work extra hard to keep him distracted on the way home. Last year the wild garlic was in bloom far earlier than it is now. The reason I know this is because when it was ready last year I blogged a salad dish that I made when I foraged some on the way home from the shops on the 23rd of March last year. The 4 year old remembered where it was this time around and has been waiting patiently for me to say it’s alright to pick a small amount to take home and enjoy. Today, I bought some smoked, peppered mackerel in the Supermarket. It can be a strong taste for some but it is fantastic for flavouring fish pies, kedgeree, and risotto. 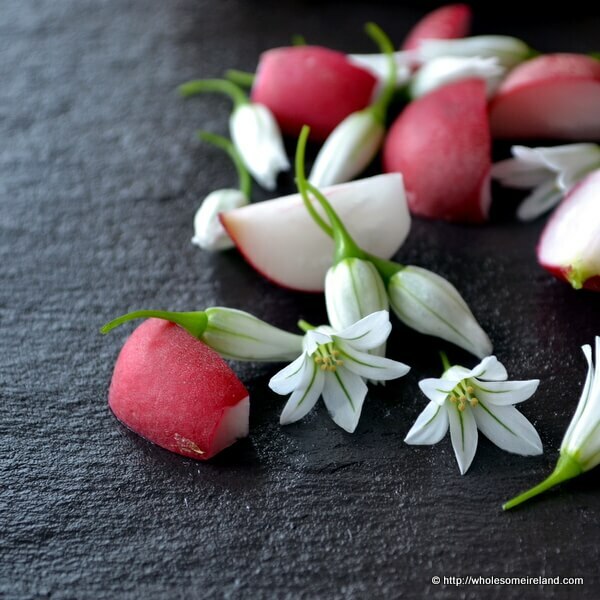 I then picked some wild garlic on the way home and paired the flowers with the first of our peppery radishes from the allotment. For the toast, I chopped the stems of the wild garlic and added the flesh of half a piece of the fish, with a teaspoon of good quality mayonnaise. I then mashed it together loosely and pressed the mixture onto a piece of crisp toast. If you had crackers this works just as well. In the photo you can see the beautiful flowers and radish resting on the board. I did of course pile them on top of the mashed mackerel before I ate them but they just looked so pretty today that I couldn’t resist! Great when it’s both pretty and tasty isn’t it? smoked mackerel is one of the really great stand by’s though I like to get the lovely soft whole ones from the East European shops. Cheaper too. Yes that was why they were all hoovered up. Himself reckons half of the visitors came just to eat my cakes….. Story of my life! By the way, those are the radishes *somebody* sowed individually that we noticed on the day!